CONDITION REPORT: Excellent condition and all original. The dial is in mint condition and retains the original tritium markers in original condition. The Omega Speedmaster Professional Chronograph, also known as the "Moonwatch", is famous for being the watch worn by astronauts during the first Moon landing. 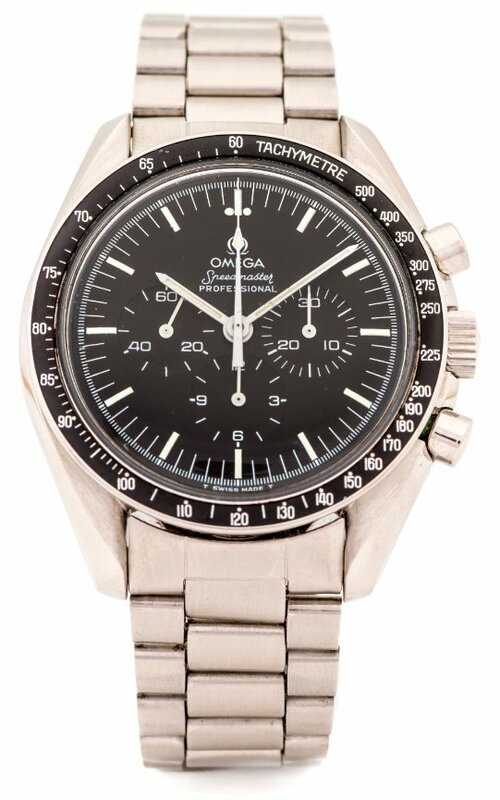 NASA’s harsh and intense qualification tests leading up to the Apollo 11 mission examined several watches from Switzerland’s top manufacturers such as Breitling, Rolex and Omega; the testing was concluded in March 1965 with the final selection awarded to the Omega Speedmaster, because it stood apart from the rest as it continuously kept within 5 seconds accuracy in its per day rate. As a result, it became the official watch of the U.S. space program.